Reviews: Zoom LiveTrak L-12 (Cover), Korg Prologue, Nob Control nOb, IK Multimedia iRig Keys, Soyuz SU-023, Polivoks Pro, Soundcraft Notepad-8FX, Lindell Audio WL-3 R.
Techniques: Mixing Album Projects, Zaytoven: Producing Trap, Managing Projects With Databases, Inside Track: Justin Timberlake. 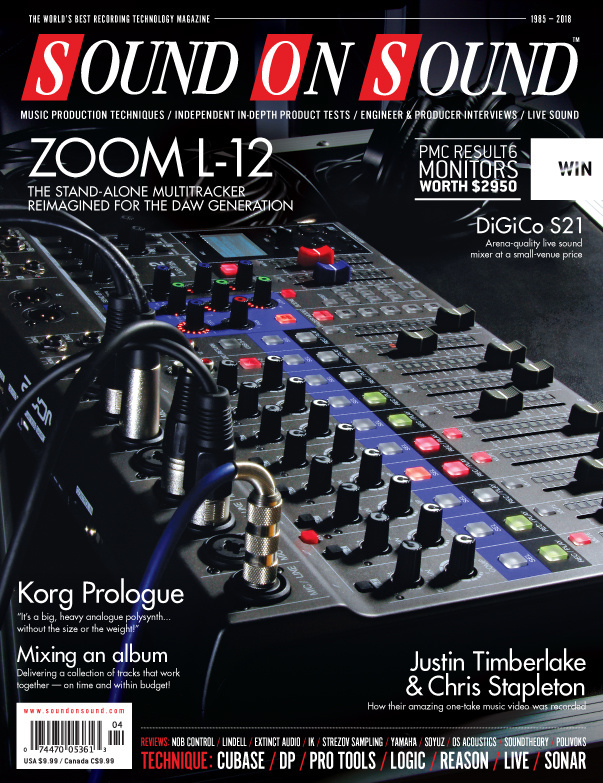 In the S21, DiGiCo have made their world-class digital mixing technology more accessible than ever before. We spent some time with it, both at DiGiCo HQ and at a real live event. DPA’s iOS-friendly interface and mic set is aimed squarely at broadcasters and interviewers who need the very best audio quality. This excellent library features a deeply sampled solo violin expressively played by the maestro himself. Born out of a successful microphone repair business, Extinct Audio’s first product is inspired by the classic Danish ribbon mics of old. The iRig Keys I/O offers a one-cable keyboard controller solution for computer- and iPad-based musicians. Rainmaker consists of a stereo 16-tap spectral delay paired with a 64-tap comb resonator, the latter sporting external triggering options that turn it into a (single-voice) Karplus-Strong synthesizer. Korg’s new “flagship analogue synthesizer” actually incorporates plenty of digital technology — and to great effect! How did the 500-series’ first discrete, transformer-balanced full channel strip fare in our tests? Miktek’s T89 dynamic follows a familiar physical format, offering a super-cardioid response and with a frequency range that extends right up to 19kHz. Mission Engineering’s 529 is designed to convert the 5V of direct current available from any USB power source into the 9V DC used by most of the world’s guitar effects pedals. Welcome to the world’s smallest serious DAW control surface! New British company OS Acoustics impress us with their high-performance debut monitor. The original Polivoks is rare, iconic, nasty and fabulous in equal measure. So how does a modern-day reincarnation compare with the classic? Rycote's innovative Cyclone wind shielding device has been joined by a range of Stereo Cyclones. We test the MS4 kit with a Mid‑Sides stereo array of Sennheiser MKH30/40 microphones. Boasting two mic preamps, USB interfacing and Lexicon effects, this keenly priced mixer holds lots of promises. Does it deliver? Soundtheory’s first plug-in doesn’t just give you a ‘make it sound better’ control — it has five of them! Soyuz’s classy new creation brings a Soviet-era capsule design in from the cold. But how does it sound? The Bulgarian choir specialists go epic with a trilogy of choir libraries. A unique new DSP tool allows disparate sounds to be mated — with intriguing results! Recording, triggering, sampling, effects: Yamaha’s versatile new drum module does it all. Zoom reimagine the stand-alone multitracker for the DAW generation. We show you the many ways you can chop up and manipulate loops in Sonar. We explore DP’s tools for applying pitch-correction, harmony generation, pitch-quantising and pitch effects to vocal tracks. Database software might not be as exciting as the latest virtual instrument or DAW — but it can be even more effective in helping you get work finished. Performed live and filmed in a single take, Justin Timberlake’s ‘Say Something’ is one of the most ambitious music videos ever made. We serve up some fresh ideas for vocal processing using Track Stacks in Logic Pro X. How does a platinum-selling producer make music on a mobile device? We sit down with MeLo‑X, who found commercial success co-writing tracks on Beyoncé’s Lemonade, as he talks about the real-world advantages of making music on a phone or tablet. We explore Live 10’s new MIDI Capture and Multi-Clip editing features. Mixing an album can be more challenging than working on songs individually — but it can also be the most satisfying achievement for an engineer. Some of the most important features of a hardware console are found in its master section. Here’s how to add them to the Pro Tools mixer. Cut to the chase with Reason templates. Our engineer figures out the best way to capture a dozen songs in a single afternoon. Using a unique combination of virtual musicians and acoustics manipulation, Dr Shelley Katz aims to bring orchestral performances to even the most modest of venues. Can Cubase’s Groove Agent SE4 take care of all your virtual drummer needs? Sounding Off: Is Hard Work Enough? If you are trying to make a living in the music industry at the moment, you might ask yourself "What are my chances?" Read more about Sounding Off: Is Hard Work Enough? Central to Atlanta’s white-hot rap scene is producer Zaytoven, who brings a West Coast flavour to trap. Q. How do I prevent my preamp overloading my audio interface? Read more about Q. How do I prevent my preamp overloading my audio interface? I finally have a spare bedroom into which I can put some studio gear. Assuming I’ve treated my room acoustically and sound leakage is not a concern, what size of monitors would it be worthwhile me considering? Read more about Q. Should I choose small speakers for a small room? Q. Why don’t my mixer inserts work when using the mic input? My Soundcraft EFX12 mixer is pretty new, but when I try and use a channel with a microphone, and an insert cable running to an effects loop with various Moog pedals, I get almost no level from the mic. Can you help? Read more about Q. Why don’t my mixer inserts work when using the mic input? Media content for the April 2018 issue.